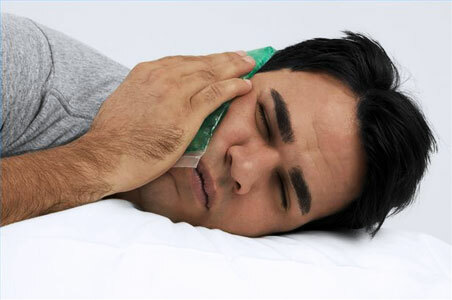 Non-invasive TMJ Treatment: No More Headaches! How exactly does Dr. Sid Solomon’s non-invasive TMJ treatment get rid of those relentless headaches and migraines? Dr. Sid Solomon, Los Angeles’ leading TMJ specialist, is dedicated to successfully combatting TMJ pain and headaches non-surgically and in the most comfortable environment possible. Dr. Solomon’s boutique office features a special relaxation room that will mentally transport you to a high-end spa. The room is conducive to not only jaw relaxation, but also full body and mind relaxation. Our goal is to create an environment where you can feel completely relaxed and even forget you’re at the dentist! While you are in the relaxation room, an EMG will first be taken of your jaw in its current state. Dr. Solomon may tell you to alternate between clenching and relaxing. These EMG results will be analyzed to determine which muscles are overworked and see whether there are imbalances between the right and left sides. Next, Dr. Solomon will place a small piece of wax with a magnet inside your mouth between the front lower gums and the lower lip. He will then ask you to open and close your mouth so he can track your jaw movement on the computer. This information will be used to observe whether there are limitations in your movement and if the teeth are in the right place. The best part is saved for last when the jaw muscles will be completely relaxed using a TENS machine or Myomonitor. The TENS treatment will take about an hour during which gentle electrical stimuli will massage the jaw. During this time, many patients often doze off while taking advantage of the serene spa environment and full body massage chair. After the treatment, the jaw, in a completely relaxed state, represents the ideal bite for the patient. An impression or mold will be taken and sent to a dental laboratory for your custom-made orthotic to be created. In about two weeks, you will return for a second appointment when the orthotic is ready and be given specific instructions. The orthotic is made out of clear acrylic and hides behind the lower front teeth. It is very comfortable, easy to wear, and not obvious. It will slowly adjust your bite to the proper alignment so your jaw muscles and TMJ joints can work harmoniously. As a result, the headaches, facial, and neck pain will all be eliminated. Dr. Solomon also offers BOTOX treatment for TMJ, which has been proven to effectively and immediately eliminate facial pain and headaches associated with TMJ. Stop living in pain! Call (310)475-5598 today to make an appointment or personal consultation with Dr. Solomon today.